Easter craft projects don’t have to take long to make. Our decorative plant pot is simple and easy to make, and it looks great too. This plant pot is given a whole new lease of life with just a few simple craft essentials, many of which you’ll probably already have in your home somewhere. You can fill your pot with anything form growing spring bulbs to cut flowers, for a pretty and seasonal presentation solution! It makes the perfect gift to give to friends and family for Easter, much better than a chocolate egg which they’ll probably already get lots of. This doesn’t just have to be for Easter either, you could make it for any time of the year, changing the colour palette for the season. You could make it for a birthday or Christmas. Below we’ve written our instructions explaining how to make your own. 1. Take a flowerpot (we used an old terracotta pot), wrap a piece of cream paper around the outside and cut off any excess. Tear the edges then secure at the back of the pot with either double sided tape or some glue. 2. 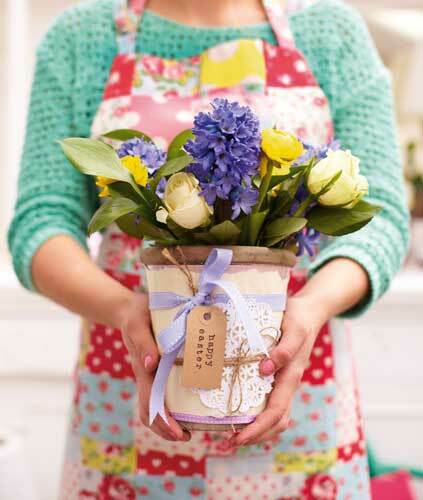 Tie lengths of pretty ribbon in different widths around the pot, with a bow at the front. Use a dab of glue if they start slipping down. 3. Place a mini doily on the front and wrap a few lengths of twine to hold it in place. 4. Hand stamp (or write) ‘Happy Easter’ or the recipient’s name on a small luggage tag, then tie it onto the ribbon. 5. Finally fill you’re your pot with either a beautiful bunch of blooms or plant some pretty springtime bulbs.